There are many online web development business which come and go and we are pleased to continue to build on our sustainable success. As you know, developing and maintaining the right online communications strategy is integral to any successful business. At Webtron, we take great pleasure in making this a reality for our clients. Our success depends on the continuing success of our clients. As we celebrate our seven year anniversary in business, we would like to take this opportunity to sincerely thank all our clients and suppliers for their loyalty and ongoing support. We will continue to strive to exceed our client’s expectations to provide cutting edge online solutions. Of course, our business is our people, and we would also like to thank our team, clients and suppliers. We look forward to continuing to build on our relationships and to working with you all in the future. Here’s to another successful 7 more years! Webtron sell Australia’s first house via a live webcast auction online in 2007. 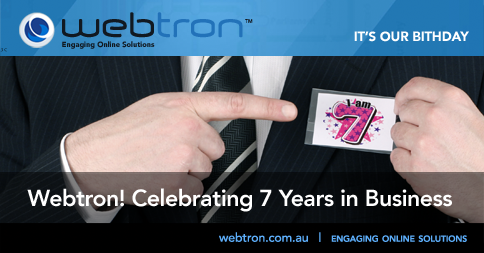 Webtron makes the news in Herald Sun , The Age, Sydney Morning Herald and Leader newspapers. Designing websites and web apps for an assortment of well know businesses that generate millions of dollars sales every year.